In the wake of conflicting flight path information with Russian and Turkey differing on the flight path of the Russian aircraft that Turkey downed over Syria, comes the incredulous claim that Turkey did not recognize the aircraft as Russian when it shot the aircraft down. This unbelievable statement comes as Hollande and Putin Seek Common Ground but Remain at Odds Over Syrian Targets. The leaders of France and Russia held more than three hours of talks at the Kremlin focusing on the fate of the Syrian president and on which parts of the armed opposition should be protected from air strikes. The summit was part of Mr Hollande’s push for a broader coalition against Islamist radicals Isis after the attacks in Paris a week ago. The gulf between the leaders on the future of Mr Assad remained as wide as ever. Mr Hollande reiterated his position that Mr Assad “cannot play a role in the future of this country” but Mr Putin rebuffed him, repeating his standard phrase that only the Syrian people could determine the future of their country. The issue of widely diverging goals of the external actors in the Syrian war gained renewed urgency after Turkey shot down a Russian fighter jet on Tuesday which it said had violated its airspace. Ankara’s move is believed to have been partly motivated by the fact that Russia’s air force has been bombarding Turkmen villages in northern Syria, an ethnic group that Turkey views as an ally. Turkey’s President Recep Tayyip Erdogan said on Thursday that Ankara had not recognised the aircraft as Russian when it shot it down. Following a slew of announcements of economic retaliation against Turkey, Mr Putin angrily dismissed this claim as “impossible” and said Russia had provided the US with information on the time and location of its sorties. Putin's claim is correct. It is impossible to believe Turkey did not know who it was shooting at. In fact, the claim is so absurd, and so much an obvious bald-faced lie, one has to question Turkey's claim that the Russian aircraft did indeed violate Turkey's air space. 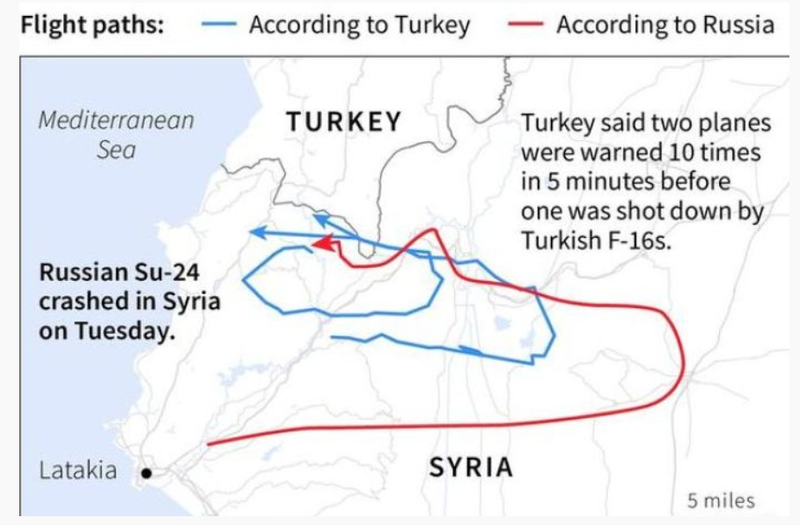 The above image from Turkish military releases recording of 'warnings' sent to downed warplane, Russia disputes flight path. Turkey claims it issued warnings. I do not believe those warning claims are in dispute. What is in dispute are conflicting flight path claims. 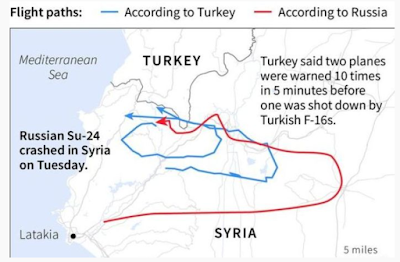 If Russia violated Turkish air space, it was for at most a few seconds. But here's the real question at this point: After Turkey's unbelievable lie that it did not know what it was shooting at, how can anyone possibly believe Turkey, on anything, related to this matter?